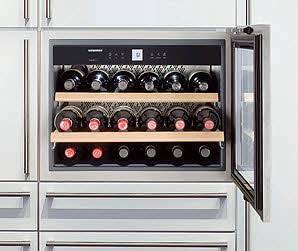 The Liebherr HWS1800 cradles 18 bottles in the lap of wine luxury. If you’re like me, your wine experience is limited to the three wise men: Carlo Rossi, Robert Mondavi and — of course — Charles “Three-Buck-Chuck” Shaw. 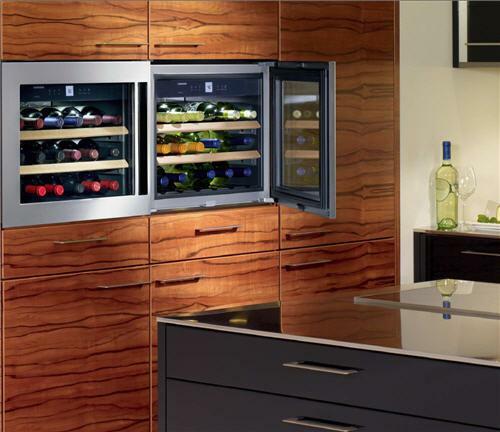 But, Liebherr’s HWS 1800 wine compartment is just freakin’ cool. Plus, inasmuch as I love craft beer, I can understand the desire to collect and mature fine wine. You know, the really good stuff. And if you’ve got it, why wouldn’t you flaunt it? Don’t banish it to the basement or under your counter — display it at eye level! The fully integrated design allows this stainless steel unit to sit flush with cabinets. And the recessed “pocket” handle and lack of exterior branding won’t interrupt the look of your existing kitchen. Now, it’s just a little guy, measuring 18-by-24 inches, which is the same exact dimensions as a built-in coffee system or steam oven. But that compact footprint wants for nothing. Side-by-side wine compartments: because one is the loneliest number. Tinted glazed doors block UV rays. Fifty percent to 80 percent relative humidity prevents cork shrinkage. Untreated wood shelving emits no odor. LED lighting creates no heat (plus it’s energy-efficient and long-lasting). A charcoal filter perfects air quality by eliminating dust, dirt and odors. I don’t think they’re missing anything, are they? p.s. Liebherr is pretty much the greenest refrigeration, not only in its products but its manufacturing process as well. Previous Will Black Friday kill Thanksgiving?